CyberPower living in i7th heaven? When system integrators go head-to-head the winners are you and me. Margins get cut and extras get thrown in. That's exactly what's happened between CyberPower and PC Specialist, with the former putting together the i7 Heaven as competition for the latter's Vortex PC. And it's a close run thing. The Vortex was the first PC we saw with Intel's i7-950 CPU and a proud beast it was. Packing incredible performance into a dangerous-looking case with top-of-the-line Nvidia graphics and a £1,750 price tag, it rightly blew us away. CyberPower's i7 Heaven has managed to pack in the same CPU, but comes in £350 cheaper. Obviously, there's no way it could afford to package the same multi-GPU as the Vortex and still cut the price, but it has made a smart compromise. 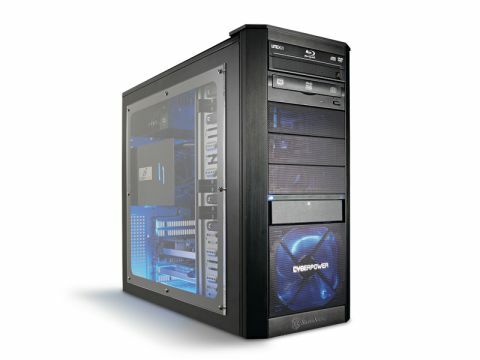 CyberPower has opted for a pair of 1GB GTS 250s from Sparkle. While that means it can't quite deliver gaming performance on the same level as the PC Specialist, it's not far off and for far less too. CyberPower has also opted for a different cooling solution, going for CoolIT's TEC heavy FreeZone Elite rather than the increasingly popular Domino A.L.C. In theory the thermo-electric cooling (TEC) power of the Elite should offer more overclocking headroom than the fluid heat exchange of the Domino. Unfortunately, the unit that was shipped to the office wasn't terribly stable. We managed to benchmark our entire gaming suite, but the cooling unit proved too flaky to give us any run-up at a serious overclock. Still, with a fully-functional FreeZone Elite chilling your chips the fabled 4GHz frequency shouldn't be out of the question. CyberPower has also slashed the amount of memory in the i7 Heaven compared to the Vortex, leaving us 6GB as opposed to the unwieldy 12GB offered by PC Specialist. Realistically though that much RAM is more about bragging rights than of any serious benefit. In this setup the i7 Heaven is just about on-par with the Vortex; it doesn't perform quite as well in-game, but will save you a lot of money. There's also an i7-920 version on the cards for another £200 less which given that chips insane overclocking prowess could be well worth another percent – or two.